Whether from a well or a municipal supply, the water flowing from the tap is not always as clean or as fresh-tasting as it could be. 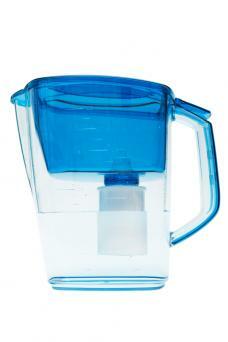 Water filters pick up the slack between what comes from the tap and what you want to put in your body. Options vary based on the types of contaminants your concerned about, as well as the cost and installation complexity. It doesn't get any easier than using a countertop pitcher filter system. You pour the water into the pitcher, it trickles through a filter mounted under the lid and within a few minutes, you can fill a glass to drink or a pot on the stove for cooking. These store easily in the refrigerator, making it convenient to filter and cool the water simultaneously. The upside of a pitcher-type filter is its simplicity and affordability - perfect for renters who don't want to invest money in a filtration system for a house they don't own. However, to remain effective, the filter cartridge must be replaced frequently, driving up the actual cost of the filter. Another downside is that they are not on-demand - you have to wait a few minutes for the water - and they do not remove all potential contaminants. A pitcher-style filter from Brita with an electronic indicator to tell you when to replace the cartridge is available at Filters Fast for under $40. For a filter on a budget, check out one by Dupont, available at Rakuten for $10. A tap filter is a variation on the countertop model, but the filter is attached directly to your kitchen faucet. Unlike the countertop models, they provide filtered water on demand, though the rate of flow is generally much slower than what normally comes out of the tap. For this reason, faucet-mounted filters come with an on/off switch, so you can choose whether or not you want filtered water based on what you're doing with it - i.e. if you're washing dishes, you may not be concerned with using filtered water. These models are fairly inexpensive, but take a little plumbing familiarity to get them screwed into place. 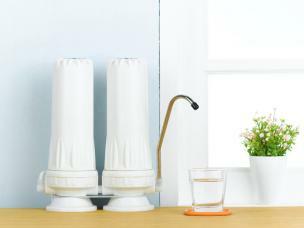 Smaller models are entirely self-contained at the end of the tap, while larger versions sit on the counter with a short hose that goes to the tap. One potential disadvantage of these is the space they take up can make a tight kitchen feel even more cramped. PUR makes a stainless steel faucet-mounted filter available at Filters Fast for $40. For $200 Build.com has a sleek filter unit by Brondell intended to sit on the counter next to the sink that looks like a designer kitchen appliance. There is room for larger filters under your sink, meaning you can install something that will filter the widest variety of contaminants. The cost increases accordingly and you'll need to hire a professional to install it, unless you have solid plumbing skills. Aquasana offers a three-stage under-sink filter unit with its own bronze spout that must be installed at the edge of the sink for about $175. Buy it directly from Aquasana. Aquacera makes a premium under sink water filter with its own storage tank that allows for much higher water pressure than comparable models, retailing for about $60 at WaterCheck.biz. The main reason for going with a whole house filter is because you want to filter not just the water you use in the kitchen, but the water you bathe in, brush your teeth in and, possibly, the water you wash your clothes in. Including installation, these systems are often in the four-digit range, but give peace of mind for homeowners that have serious health concerns about their water or live in places where the water has a foul taste or odor or is extremely hard. High end or highly specialized filtration systems tend to take up a lot of space, making a basement, crawl space, or utility room the only logical place to install one. Some need specialized maintenance, like the addition of salts, which can be messy and is only suitable for a utilitarian space. Others actually discharge a significant amount of water, so they need to be located in proximity to a sewer/drain line. Pelican Water Systems makes a 4-stage high-flow under house filtration system with a limited lifetime warranty for under $900, available through the company website. Kalyx.com sells a whole house reverse osmosis filter by HydroLogic for under $400, which includes a one year warranty. Not all filters are created equal in terms of what they remove. The following list is organized from the least expensive options to the most expensive. Keep in mind that higher quality filtration systems may incorporate several technologies depending on the specific contaminants found in the water. Micropore filters are the simplest filtration technology; they are used mainly for removing sediments and microorganisms. They operate on a purely mechanical basis by filtering out any particles larger than the pore size of the filter. Activated carbon filters remove chlorine, volatile organic compounds (VOCs) and most heavy metals, but they are not effective for many other chemical pollutants. They will, however, improve the taste of your water. Countertop and faucet-mounted filters are generally of this type and they are often a component of the larger, more complex under sink or under house filtration systems. Ion exchange filters include water softening devices and others that are designed for contaminants that are found in particular geographic areas. Reverse osmosis filters remove most things that carbon filters do not, making them perfect complements for each other. They are much more expensive and high tech than carbon filters, however, and they also wastewater, sending much more down the drain in the process of filtration than they provide to the tap. 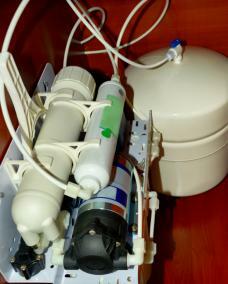 Most reverse osmosis filters are installed for the whole house, though there are smaller under the sink models. All water filters require some maintenance, as the filtration media must be periodically replaced or replenished to remain effective. In general, any water filter should be checked every few months to see if it needs attention. Premium models come with a built-in monitoring system that tells you at a glance if it's time to replace the filtration medium. Installing a water filtration system is one of the simplest ways you can attend to your family's health over the long term. 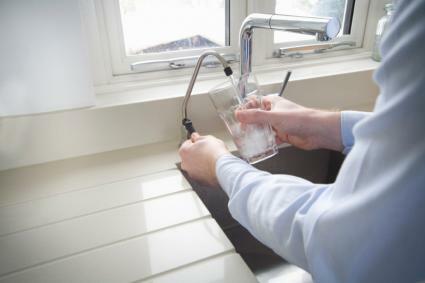 Most water filtration companies offer a free water test, making it an easy choice to at least find out if your water quality needs to be improved.